In Massachusetts, we enjoy the classic rock hit “Dirty Water,” especially during baseball season in the summer. But it’s a whole different story when that dirty water invades your home. According to the Federal Emergency Management Agency (FEMA), flooding is the most common natural disaster in the United States, affecting every region and state. Yet there are many misconceptions about flood insurance, and you might mistakenly believe your home is covered when it’s not. 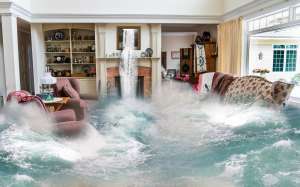 Misconception: My homeowners insurance will cover me in case of flood. Reality: Most homeowners and renters insurance does not cover flood (or earthquake) damage. Flood coverage is only available through a separate policy from the National Flood Insurance Program, which you can purchase through some local insurance agencies, like The Dowd Insurance Agencies. Misconception: I don’t need flood insurance because I don’t live near water. Reality: If you live on a flood plain, you may be required by law or your mortgage company to purchase flood insurance (enter your address into FEMA’s interactive flood map to see your risk). However, between 20-25% of flood damage occurs in areas not considered at high risk for flooding. Flooding can be caused by heavy rain or melting snow, both of which we experience here in the Northeast. Misconception: I have flood insurance, so I’m all set. Reality: Having flood insurance is important, but it’s just as important to understand what it covers. The policy offered through the National Flood Insurance Program covers up to $250,000 for the replacement cost for the structure of your home, and up to $100,000 for the actual cash value (which factors in depreciation) of your personal possessions. If your home or possessions are worth more, you may want to purchase supplemental coverage. There may also be limits as to what is covered for personal possessions in your basement. Keep in mind, too, that flood insurance does not cover living expenses if you are forced from your home due to flooding. Also, it takes 30 days for the flood insurance coverage to kick in, so waiting to buy it until you see a hurricane is tracking toward your area won’t have you covered in time. FEMA notes that the damage from just one inch of water in your home can cost more than $20,000. A more serious flood can result in financial devastation if you aren’t covered. If you aren’t sure if you should consider flood insurance, contact us. We’ll help you evaluate your risks, and advise you as to the coverage you should have.